‘Action’ refers to performance events, especially those involving a strong degree of uncertainty and improvisation. The project included here is an action in that it formed around an idea, was manifested and then the idea set loose to be interpreted and manifested in other locations, by other people, known and unknown to the originators. On the eve of the second invasion of Iraq, 2003, Wallace Heim, Simon Pardoe and Linda Inman initiated a viral social practice action. 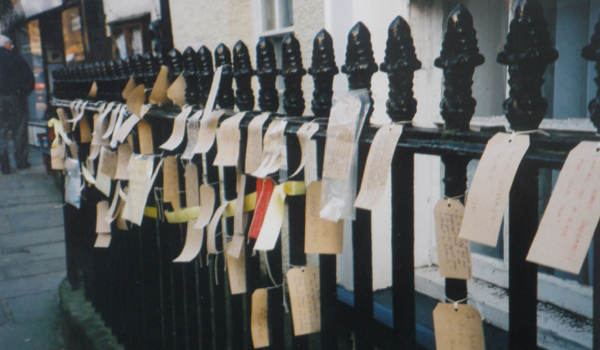 We asked people to write, draw or in another way express their views about the proposed invasion on a card, and tie it to nearby street railings. The action started in Ulverston, Coniston and Sedbergh in Cumbria, and spread as an instruction given online to Cambridge, London, Bristol, Oxford, Edinburgh, Glasgow, Newcastle, Sheffield, Manchester.